What Do You Do with the Triangles Cut From Folded Corner Blocks? Thread: What Do You Do with the Triangles Cut From Folded Corner Blocks? You know, what's left over after making a flying geese block with the rectangle and two triangles, or the strips where you join two pieces on an angle. I've been saving mine and plan to make crumb blocks. Most of mine are from 2 1/2" strips so they're pretty small. Those from fabrics I'm not crazy about, I use as starter pieces when chain piecing. I'd love to hear what you've done with them. I have a bag full but when I last trimmed blocks, I decided to toss them into a plastic shoebox. Guess who found them??? The cat who will do anything to lay on a piece of fabric. Use them for smaller 1/2 sq, triangles or whatever you find to use them for. They make something small like rug mugs, doll quilts etc. I sew them together and make pinwheel blocks. If you sew them together while they are still attached to the block, it's a lot easier. I was doing that then decided they are too small for me, so I have been throwing them away. I'm thinking of mulching the garden with them. Snowball blocks generate quick a few, too. I sew two together for the center of string blocks. When I am doing a block where there will be a triangle of fabric cut off...after I have sewn on the drawn line...I go over about 1/2" (1/4" if a small amount) and sew another seam. I then cut between the two sewn lines...instant half square triangle blocks! I save these up, seperating into baggies by size. When I have enough, they go into a quilt, or border of a quilt. excellent idea. I'll do that from now on. I hate to waste it and this seems pretty efficient! I hope she doesn't grow any more. 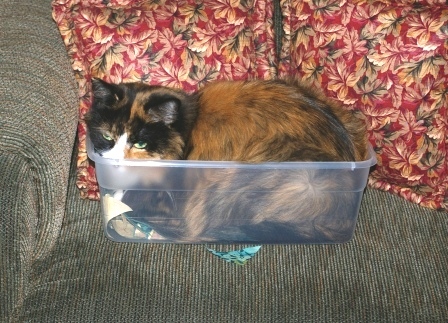 But they would make a nice pillow top for Calico! In the past, I've just thrown them out. However recently while making a heart quilt for my dd, I simply couldn't waste THAT much material. I made the corners into 1/2 sqaure triangles by sewing another strip before cutting the 'extra' off. Now I have three stacks that are 4" high! What I'll probably do is sew them into a strip. Then sew it vertically on a backing to a quilt, off center of course! I did something similar with extra 5" blocks that I had left over from a house block quilt I made for our housekeeper at work. As it turns out, I think she likes the backing better than the front. Her favorite color is the main fabric on the back. Go figure! I have a huge amount of triangles of all different sizes. I also never know what to do with them all. I do like the pinwheel idea though. I've heard of the Cat in the Hat but the kitty in the quilt blocks is something else altogether!!!! I either save them for a scrap quilt if they're larger than, say 1x1, or I put them in the garden as mulch. Well, I used to save them for that 'one day' project. Then our local humane society wanted dog beds and they wanted them filled with scraps that could be washed. No more of those little pieces saved for the mythical 'someday' and both the pets and I are happy. I don't know. I make flying geese using the no waste flying geese method so I don't have any waste or pieces to cut off. A bed without a Quilt is like a Sky without Stars..Sew On! I love the cat - and my cat is the same. However, mine prefers to lay on fabric that is being WORKED on. Carrie, Queen of the Seam Rippers! I leave mine IN any quilt I'm not planning to hand quilt, here's why. When using this square-on-a-corner technique, it's easy to sew these squares across the diagonal, press to the corner, and then find you have a bit of overhang no matter how careful you were. When you cut off the background and the middle layer of the triangle, you remove the absolute square or rectangular cut of the base shape...and that makes it harder to line up the snowballed segment to the next block segment. Even if 'overhang' is there, you can match edges of the segments together well if you leave the background part of the 'triangle'. Thanks for the suggestions and comments on the cat (who will also lay on my sewing machine bed so I can't sew). Thanks for the link to the Triangles page at quiltville. I've been to the site but not to that page. I wish I'd thought to sew that seam before cutting them off. Oh well...next time since every project lately has these leftovers. 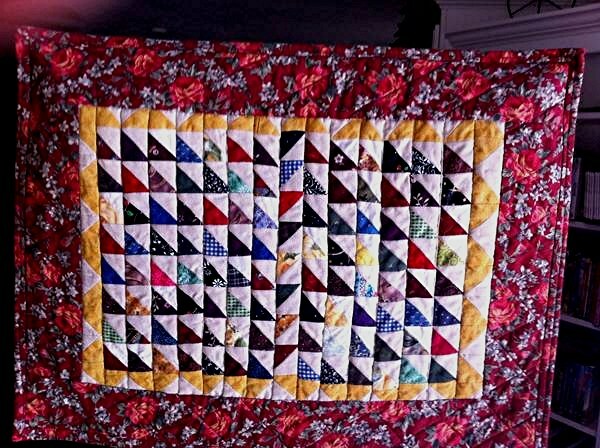 Jan, I used your method in one quilt - a skill builder project - but found that I dind't like the bulk. Ah, well to each his own, of course; that's what makes our world so special! I'm glad you tried it at least. OMY! What a great picture of your cat. They always try to fit into the tiniest places. I use mine for carpeting. Ha! the triangles, not cats! EDIT: Jan, That is a great suggestion. I will give it try! Last edited by ube quilting; 02-24-2012 at 05:17 PM. :-( I wish I was a full time quilter!